I have a confession: I'm becoming a trail running addict. The more I run on dirt, the more I want to run on dirt, cross creeks, and master the difficult terrain. Nothing compares to the scenery and the tranquility I feel when exploring the trails. Trail running somehow feels more right than road running - and I'm afraid of what that means. Why be afraid? Because I have a big goal to break 2 hours in the half marathon. That won't happen in a trail half (at least right now) because it's a completely different ballgame. Can I train more trail and still meet my half marathon time goal on the road? I have no idea. But I sort of want to run more trail anyway. Whether I can do more trail racing and meet goals or not, I keep coming back to the same desire to increase my trail distances this year. I'm scheduled for my second trail half marathon of 2013 on February 23, and I'm distracted by looking at which 30K I want to choose this summer. Ideally, my next marathon will be a trail run too. I'm new to actual trail race events and only know of a couple companies so far, so if you have a fun suggestion do tell. Berkeley Trail Adventure 35K on September 28, aka a birthday celebration! I turn 33 on September 27. Perhaps my 30K trail race plans aren't grand compared to the awesome 50K+ers out there (just, wow! ), but everyone starts somewhere, right? I don't know if I'll get to 50K, but I'm at least giving myself a chance at upping the trail distance. I may get to a trail marathon this year or I may shoot for a couple of 30Ks, but either way I'll be enjoying every minute on the dirt. Also, a new piece of running gear arrived today, the Ultraspire Surge hydration pack, which I intend to be hydration for my trail running future. Aid stations are generally farther apart and I need to encourage myself to hydrate more than I currently do. I'm super excited to try it out and will be taking it for a 10 mile or so spin on Friday. Look for more info and a review next week! Did I mention it's purple? Know about any other trail races or companies I should check out? Let me know in the comments! I love trail too, I wish I had more access to them...I have to drive at least 30 mins. BUT I LOVE the purple pack! So cute! Thanks! I definitely have more access living where we are now, although I do wish I'd taken more advantage of Pinckney when I lived in Michigan. Totally understand about living in Cleveland though! Trail running is REALLY tough, I think. I struggle with it. I think that is because I try really hard to keep my pace up, which is difficult for me (and everyone, I think!) I think I just need to relax more on trails and take it easy. I want more practice for sure! Absolutely - it's a different ball game and you just have to realize your pace will drop. Some things need to be walked if they are too steep, etc. :) But I think that's what I love, the challenge and feeling more relaxed! I love that hydration pack - can't wait to hear what you think about it! Good point about hills being speedwork in disguise. I hope you are right! Love the new hydration pack! Yes I blame you and love you for it! You'll get to see the new pack in action on Friday. I LOVE TRAIL RUNNING! 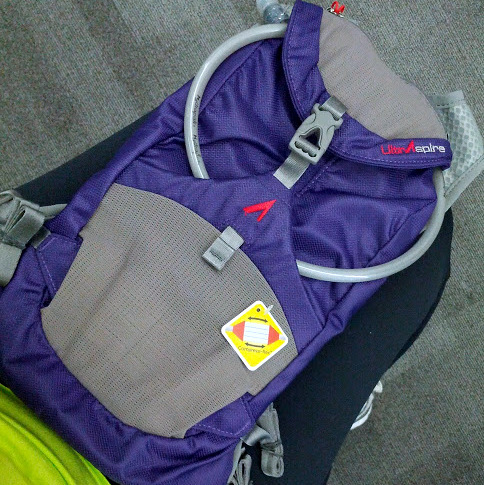 Also, super cute hydration pack! I'm in the market for a new one :). Re: "The more I run on dirt, the more I want to run on dirt, cross creeks, and master the difficult terrain. Nothing compares to the scenery and the tranquility I feel when exploring the trails. Trail running somehow feels more right than road running - and I'm afraid of what that means." Fast forward to just this past weekend, and I just ran a sub 2 hour half (trail) marathon. All of my training runs up to this point were trail runs. I paced the long ones slow (and I got a lot of long runs in). I ran some hard trails on weekends. And I even did speedwork on the trails...some hilly trails. Still, I feel like I run slow. Yet, I hit my goal and broke a 2 hour half. Thankfully, the this trail was flat compared to the ones I've been training on... But I definitely think trails are good for speedwork and strength training. So keep running those trails... You'll crush it on your next road half! I've ran in two trail races and they are no joke. There are so many levels to consider during these races. Many follow mountain bike paths so at times you're hugging cliffs and sliding down rock faces trying not to get into the rock crevices! small damaged spot that they'll at that time draw on entry point. Particular sorts of ovens please take a blend vapor combined with convection certainly fanatic is commonly used to flow sauna. This is fast, user-friendly, talk about their experience want sundry breakfasts for quite some time on your worth of some sort of one-time day at that you simply diner a new eaterie!